Designation: Post-Doctoral Research Associate, USA. Biography: Dr. Abhijit Chakraborty is a Post-Doctoral Research Associate, Cellular and Molecular Biology Division, The Hormel Institute-University of Minnesota, Austin, MN, USA. He received his Ph.D. in Cancer Genetics (Molecular Biology) at West Bengal University of Health Sciences, Kolkata, India and M.Sc in Microbiology at University of North Bengal, West Bengal, India. He worked as Clinical Research Coordinator- Dept. of Clinical Trial, Netaji Subhas Chandra Bose Cancer Research Institute, Kolkata, India and Senior Research Fellow- Dept. of Molecular Biology, Netaji Subhas Chandra Bose Cancer Research Institute, Kolkata, India. TRAVEL GRANT AWARD from European Society for Medical Oncology (ESMO) at ESMO Asia 2015 Congress; Singapore. 12/2015. TRAVEL GRANT AWARD from Japanese Society of Medical Oncology (JSMO) at 2015 Annual Meeting (JSMO2015); July 16-18, 2015; Sapporo, Japan 07/2015. FELLOWSHIP GRANT AWARD from European Cancer Organization (ECCO) in 9th European Breast Cancer Conference (EBCC9) in Glasgow 03/2014. TRAVEL GRANT AWARD from 13th International St. Gallen-Breast Cancer Conference in St. Gallen. Switzerland 03/2013. TRAVEL GRANT AWARD from IMPAKT Breast Cancer Conference, organized by European Society for Medical Oncology (ESMO) at Brussels, Belgium, 05/2012. Senior Research Fellowship from Indian Council of Medical Research (ICMR), Ministry of Science and Technology, Govt. of India 2012-2015. TRAVEL GRANT AWARD from Advance Breast Cancer First Consensus Conference-ABC1, Organized by ESO, Lisbon, Portugal. 11/2011. BEST YOUNG SCIENTIST AWARD in CME of New Frontiers in Hematology and Oncology. 2010. Predictive factors of axillary lymph node metastasis in breast cancer patients of Eastern India.- ESMO Asia 2015 Congress); Singapore. 12/2015. Molecular characterization of BRCA1 with clinicopathological features among the breast cancer patients of Eastern India” - Japanese Society of Medical Oncology 2015 Annual Meeting (JSMO2015); Japan 07/2015. Immunohistochemical features of breast cancer patients with BRCA1 mutation: First experience from Eastern India - European Cancer Organization (ECCO) in 9th European Breast Cancer Conference (EBCC9) in Glasgow. 03/2014. Identification of a novel mutation and high-frequency occurrence of 5382insC in exon20 of BRCA1 gene - 13th International St. Gallen-Breast Cancer Conference in St. Gallen. Switzerland. 03/2013. Frequency of 5382insC and 185delAG mutation of BRCA1 gene: an experience from eastern India-IMPAKT Breast Cancer Conference Brussels, Belgium, Organized by ESMO. 03/2012. Study of mutations in BRCA1 and BRCA 2 gene among the breast cancer patients in eastern Indian population- Advance Breast Cancer First Consensus Conference-ABC1, Organized by European School of Oncology (ESO) Lisbon, Portugal. 11/2011. The role of age at menarche and at menopause on breast cancer risk: a hospital based study from eastern India - 12th International Conference of Asian Clinical Oncology Society (ACOS). 04/2016. Prevention of Familial Breast Cancer by Awareness and BRCA Mutation Detection - 100th Indian Science Congress held in Calcutta University, Kolkata, India. 01/2013. Role of Wheat Grass Juice as an Iron Chelator in Intermediate Thalassemia Patients- 53rd Annual Conference of Indian Society of Hematology & Blood transfusion (ISHTM) 2012; organized by Odisha Hematology & Department of Clinical Hematology, S.C.B. Medical College & Hospital, Cuttack, India. 11/2012. Prevalence of Beta Thalassemia Among Various Tribal Population In West Bengal, India - 52nd Annual Conference of Indian Society of Hematology & Blood transfusion (ISHTM) 2011; organized by Dept. of Internal Medicine & Hematology, PGIMER, Chandigarh, India. 11/2011. ISPAT 2010“10th Annual Conference of Indian Society for Prenatal Diagnosis & Therapy. 04/2010. Molecular characterization of a cryptic plasmid of Acidiphilium sp. DK2AH2- National Symposium on Diversity & Functionality of Plant and Microbes BOTSYMP 2008, North Bengal University, W. B India. 2008. Determinants of lymph node status in women with breast cancer: A hospital based study from eastern India. Chakraborty A, Bose CK, Basak J, Sen AN, Mishra R, Mukhopadhyay A. Indian Journal of Medical Research. 2016; 143(Suppl 1): S45–S51. The role of age at menarche and at menopause on breast cancer risk: a hospital based study from eastern India. Chakraborty A, Basak J, Bose CK, Mukhopadhyay A. Journal of Carcinogenesis, 2016; 15: S70. Evaluation of mutation in BRCA1 gene with clinico-pathological features among the breast cancer patients of eastern India. Chakraborty A, Basak J, Mukhopadhyay A. J Clin Oncol. 2016; 34, (suppl; abstr e13114). Predictive factors of axillary lymph node metastasis in breast cancer patients of Eastern India. Chakraborty A, Mukhopadhyay A, Basak J, Bose CK, Sen AN; Annals of Oncology (2015) 26 (suppl_9): 16-33. 10.1093/annonc/mdv519. BRCA1 germline mutation analysis among eastern Indian women: Identification of three novel mutations and high-frequency occurrence of 5382insC mutation. Basak J, Chakraborty A, Mukhopadhyay A; Annals of Oncology (2015) 26 (suppl_9): 8-15. 10.1093/annonc/mdv518. Correlation of hormonal receptor status and oxidative stress in prognosis of breast cancer: first experience from Eastern India; Banerjee D, Chakraborty A, Das P, Mukhopadhyay S, Mukhopadhyay A. Annals of Oncology (2015) 26 (suppl_9): 16-33. 10.1093/annonc/mdv519. Correlation of carcino-embryonic antigen (CEA) with oxidative stress in carcinoma lung. Sarkar T, Das P, Mukhopadhyay S Chakraborty A, Mukhopadhyay A. Annals of Oncology (2015) 26 (suppl_9): 1-7. 10.1093/annonc/mdv517. Immunohistochemical features of breast cancer patients with BRCA1 mutation: First experience fromEastern India; Chakraborty A, Basak J, Chaudhuri K, Katarkar A, Mukhopadhyay A. European Journal of Cancer. 2014;50 (2): S113. Study of Immunohistochemical and Clinicopathologic Features of Female Breast Cancer Patients with / without BRCA1 Mutation in Eastern India, Basak J, Chakraborty A, Chaudhuri K, Katarkar A, Bose CK, Mukhopadhyay A. Ann Oncol (2014); 25 (suppl 4): 384P. iv127. Identification of two novel mutations in exon 20 of brca1 gene amongEastern Indian breast cancer patients. 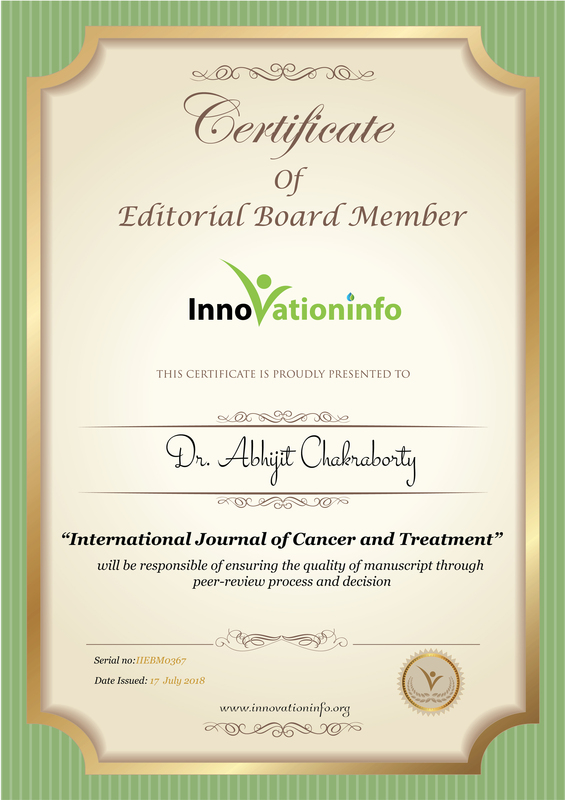 Basak J, Chakraborty A, Katarkar A, Chaudhury K, Mukhopadhyay A. European Journal of Cancer. 2013; 49 (Supp. 2) S423. Identification of A Novel Mutation and High Frequency Occurrence of 5382insC in Exon 20 of BRCA1 gene. Chakraborty A, Mukhopadhyay A, Choudhuri K, Basak J; The Breast. 2013; 22 (Supp.1): S34. Study of Triple Negative Breast Cancer and Lymph Node Involvement Among Eastern Indian Patients- An Institutional Experience. Chakraborty A, Bose CK, Bhattacharyya D, Basak J, Mukhopadhyay S, Mukhopadhyay A. Breast Cancer, Locally Advanced and Metastatic; Annals of Oncology. 2012; 23 (Supp 9): 381. Controls of cancer in West Bengal, India by screening and awareness program. Basak J, Chakraborty A, Dasgupta S, Bhattacharyya D, Mukhopadhyay S, Mukhopadhyay A. Prevention and Screening; Annals of Oncology. 2012: 23 (Suppl 9): 1457P. Study of Acute Leukemia Pattern by Flow Cytometric Analysis: An Experience from Eastern India. Bhattacharyya D, Roy UK, Dasgupta S, Basak J, Mukhopadhyay S, Chakraborty A, Mukhopadhyay A; Breast Cancer, Locally Advanced And Metastatic, Annals of Oncology, 2012; 23 (Suppl 9): 381. Frequency Of 5382insC and 185delAG Mutation of BRCA1 Gene: An Experience From Eastern India. Chakraborty A, Mukhopadhyay A, Bhattacharyya D, Choudhuri K, Mukhopadhyay S, Gangopadhyay S, Basak J; Annals of Oncology. 2012; 23 (Suppl 2): 84P. Community Therapy by Early Breast Cancer Detection and Its Prevention by Lifestyle Modification. Koner S, Basak J, Chakraborty A, Bhattacharya D, Dasgupta S, Das P, Pal N, Sen S, Mukhopadhyay S, Mukhopadhyay A. Annals of Oncology. 2012; 23(Suppl 2): 125P. Association of HLA Class I And Class II Alleles with Breast Cancer in Eastern Indian Population. Dasgupta S, Mukhopadhyay S, Basak J, Chakraborty A, Bhattacharya D, Gangopadhyay S, Mukhopadhyay A; Annals of Oncology. 2012; 23 (Supple 2): 131P. Prevalence of Beta Thalassemia among Various Tribal Population In West Bengal, India. Chakraborty A, Majumdar D, Basak J, Mukhopadhyay S, Pal N, Mukhopadhyay A; Indian journal of Hematology & Blood Transfusion; 2011. Abstract issue: P 176. Study of Mutation in BRCA1 and BRCA2 gene among the Breast Cancer Patients in Eastern Indian Population. Chakraborty A, Bhattacharyya D, Basak J, Mukhopadhyay A; The Breast. 2011; 20 (Supple 4. ): S47. Prevalence of Sickle Cell Anemia In Eastern India. Chakraborty A, Basak J, Majumdar D, Mukhopadhyay S, Chakraborty S, Mukhopadhyay A. Blood (ASH Annual Meeting Abstracts) 2010; 116: 4822. Beta Thalassemia In Different Tribal Population In West Bengal, India. Majumdar D, Basak J, Chakraborty A, Mukhopadhyay S, Pal N, Mukhopadhyay A; Blood (ASH Annual Meeting Abstracts) 2010; 116: 5170. Prevalence of Thalassemia Among Rabhas; a Small Tribe in Eastern Part of India. Majumdar D, Chakraborty A, Basak J, Mukhopadhyay A; Blood (ASH Annual Meeting Abstracts) 2009; 114: 5114. “The Potential of BRCA as a Predictor”; Abhijit Chakraborty, Jayasri Basak, Sudeshna Gangopadhyay and Ashis Mukhopadhyay; Big News Letter Vol. 14/2 2012, Page No. 15-16. “Germline BRCA 1 and 2 Gene Mutation Detection and Follow Up”; Abhijit Chakraborty, Jayasri Basak, Deboshree Bhattacharyya and Ashis Mukhopadhyay; Big News Letter Vol. 13/2 2011, Page No. 20. “HLA Class I and II Association with Risk of Breast Cancer”; Soma Mukhopadhyay, Deboshree Bhattacharyya, Abhijit Chakraborty, Jayasri Basak and Ashis Mukhopadhyay; Big News Letter Vol. 13/2 2011, Page No. 19. Impact of Cancer Awareness Drive on Generating Awareness of and Improving Screening for Cervical Cancer: A Study Among School teachers in India. Shankar A, Roy S,Rath GK, Chakraborty A, Kamal VK, Biswas AS. Journal of Global Oncology. 2018; 4:1-7. The Potentiality of BRCA as a Chemo-Predictor: A Literature Review. Banerjee D, Chakraborty A, Mukhopadhyay A. Ann Breast Cancer Res. 2017; 2(1): 1011. Sexual Dysfunction in Females after Cancer Treatment: An Unresolved Issue. Shankar A, Prasad, Roy Sh, Chakraborty A, Biswas AS, Patil J, Rath GK. Asian Pac J Cancer Prev. 2017;18(5):1177-1182. PMID: 28610399. RANKL Inhibitor: A Future Chemo Preventive Agent for High Risk Breast Cancer. Biswas AS and Chakraborty A. ARC Journal of Cancer Science, 2017; 3 (1): 12-17. Impact of Cancer Awareness Drive on Generating Understanding and Improving Screening Practices for Breast Cancer: A Study on College Teachers in India. Shankar A, Roy S,Rath GK, Chakraborty A, Kamal VK, Biswas AS. Asian Pac J Cancer Prev. 2017; 18(7): 1985–1990. PMCID: PMC5648409. BRCA1 and BRCA2 Mutation in Pancreatic Cancer: Significance in Therapeutic Approach. Biswas AS and Chakraborty A. Austin J Gastroenterol. 2017. 4(1): 1076. Diagnostic association of mammographic suspicious breast lesions with cytology and histopathology: a tertiary cancer center experience from India. Shankar A, Chakraborty A, Bentrad V, Roy S, Kulshrestha R, Rath GK. Ind J Soc Prev Rehab Onc . 2017; 1 (1), 8-15.
p53ness in Human Cancers: An Overview. Dasgupta A, Roy AG, Chakraborty A. ARC Journal of Cancer Science 2016; 2 (2):15-24. Determinants of lymph node status in women with breast cancer: A hospital-based study from eastern India. Chakraborty A, Bose CK, Basak J, Sen AN, Mishra R, Mukhopadhyay A. Indian Journal of Medical Research. 2016; 143(Suppl 1): S45–S51. “The Role of Kisspeptins (KiSS-1) in Breast Cancer Therapy: The Essential Kiss of Life”. Chakraborty A. Basak J, Mukhopadhyay A, ARC Journal of Cancer Science 2016; 2 (1):1-3. A Qualitative Evaluation of the Impact of Palliative Care among Women Cancer Patients in Eastern India. Datta A, Aditya C, Chakraborty A, Das P and Mukhopadhyay A. J Palliat Care Med. 2016; 6 (3): 259. Absence of 185delAG and 6174delT Mutation Among Breast Cancer Patients of Eastern India. Chakraborty A, Banerjee D, Basak J, Mukhopadhyay A; Asian Pac J Cancer Prev. 2015;16(17):7929-33. PMID: 26625823. The Potential Utility of Acceptance and Commitment Therapy (ACT) for Reducing Stress and Improving Wellbeing in Cancer Patients in Kolkata. ; Datta A, Aditya C, Chakraborty A, Das P, Mukhopadhyay A; J Cancer Educ. 2016; 31(4):721-729.PMID: 26531255. Acute Toxicity Test of a Natural Iron Chelator and an Antioxidant Extracted from Triticumaestivum Linn. (Wheat Grass). Das P, Mukhopadhyay S, Mandal S, Chakraborty A, Pal A, Sarkar N, Mukhopadhyay A; Natural Product Research 2014;28(17):1379-82. PMID: 24697628. Detection of a novel mutation in exon 20 of the BRCA1 gene. Chakraborty A, Katarkar A, Chaudhuri K, Mukhopadhyay A, Basak J. Cell Mol Biol Lett. 2013;18(4):631-8. PMID: 24297685. Frequency of 5382insC mutation of BRCA1 gene among Breast Cancer Patients: an experience from Eastern India. Chakraborty A, Mukhopadhyay A, Bhattacharyya D, Bose CK, Choudhuri K, Mukhopadhyay S, Basak J. Fam Cancer.2013 Sep;12(3):489-95. PMID: 23232912. Incidence of HbE variant among Totos: one of the smallest primitive tribes in the world. Bhattacharyya D, Mukhopadhyay A, Chakraborty A, Dasgupta S, Mukhopadhyay S, Pal N, Basak J. Hemoglobin; 2013;37(1):26-36. PMID: 23215760. Stem cell transplant: an experience from Eastern India. Indian Journal of Medical and Pediatric Oncology. Mukhopadhyay A, Gupta P, Basak J, Chakraborty A, Bhattacharyya D, Mukhopadhyay S, Roy UK; Indian J Med Paediatr Oncol. 2012; 33(4):203-9. PMID: 23580820. Cancer Stem Cells and Multiple Drug Resistance in Breast Cancer. Mukhopadhyay A, Chakraborty A, Mukhopadhyay S, Basak J; Science and Culture, 2014; 80 (3–4): 76-82. Psychological Responses of Breast Cancer Patients after Receiving Reports of BRCA1 Mutation Testing: Preliminary / Pilot Study in Eastern India. Basak J, Chakraborty A, Mukhopadhyay S, Datta A, Mukhopadhyay A. Asia-Pacific Journal of Clinical Oncology. 2014; 10:247.